Researchers in Exeter and India have revealed that 17 Indian natural history paintings in RAMM’s collection are by three of the most renowned late 18th-century Indian painters: Sheikh Zain al-Din, Bhawani Das and Ram Das. In the late 18th and early 19th centuries the East India Company controlled much of the Indian subcontinent. 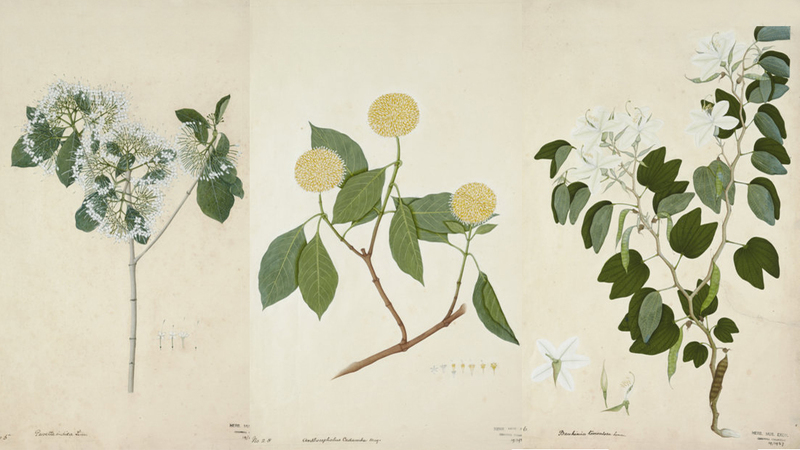 Keen to exploit and export valuable natural commodities, the Company set out to record the flora of India and commissioned Indian artists to create detailed botanical illustrations. Company School style paintings became popular with wealthy Europeans. It was not uncommon for East India Company officials (who were not employed as medics or botanists) to build their own personal collections of paintings depicting Indian flora and fauna. This collection of 86 works belonged to local botanist Richard Cresswell. Collaboration between RAMM, the University of Exeter and Kolkata’s majestic Victoria Memorial Hall has enabled experts to study the paintings. Dr Nandini Chatterjee examined the 17 signed works and discovered that previous translation from Bengali to Latin script (by persons unknown) was unhelpful. By tracing the names through various cultural frontiers she revealed the works were by a trio of celebrated artists from Patna. It is not clear who commissioned these works, but all three artists were at one point employed by Lady Mary Impey (1749-1818), wife of the Chief Justice of Bengal. Left to right: Indian pellet shrub (Pavetta indica). Watercolour and gouache, c.1770-80 by Sheikh Zain al-Din; Kadam (Anthocephalis cadamba), Watercolour and gouache, c.1770-80 by Bhawani Das; Orchid tree (Bauhinia acuminata). Watercolour and gouache, c.1770-80 by Ram Das. The exquisite paintings in RAMM’s collection can be viewed online on RAMM’s Collections Explorer and Google Arts and Culture. Works by Sheikh Zain al-Din, Bhawani Das and Ram Das are also held by the Tate, Oxford’s Ashmolean Museum and Metropolitan Museum of Art in New York amongst others. Ayurvedic medicine uses many of the plants in Cresswell’s paintings. It is one of the world’s oldest medicinal systems and practised in India for 3,000 years. It uses plants to treat conditions from skin complaints, wounds and stomach ache to internal bleeding, malaria and epilepsy. The East India Company employed India doctors to treat its staff during their trips to India. 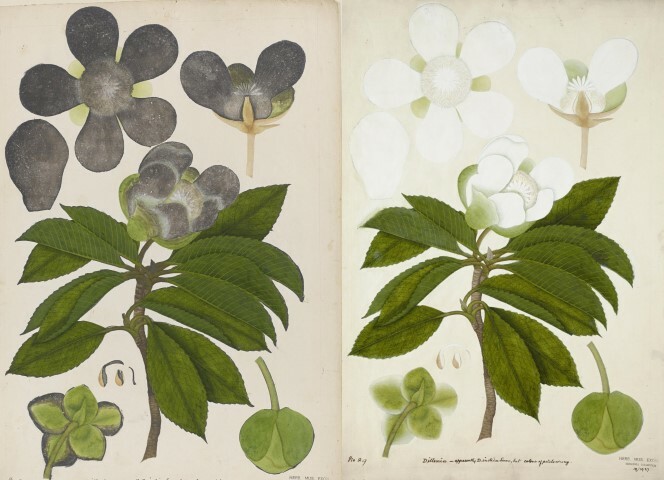 Only seven of the drawings depict people and animals rather than botanical specimens. Over time the works became damaged. Many suffered surface soiling, creasing, and tears. A £22,000 grant from Arts Council England’s PRISM (Preservation of Industrial and Scientific Material) Fund allowed RAMM to have all 88 works conserved. Atmospheric pollution also caused discolouration and staining of the colours. Lead white paint was particularly affected and blackened over time. Recently, conservation work reversed these changes and returned the works to their original, stable colours. The image above shows the most severely affected work before (left) and after (right).